It's Fall and with it comes some of our favorite one-off beers! If you were one of the people that asked us to brew our Rauch Marzen Lager (smoky amber colored lager) you are gonna be very happy cuz it's coming in October. This delicate Marzen style lager is modeled after our favorite Bamberg brewery Spezial's Rauch. Our New World Ale is back again as our Seasonal Ale for the autumn. This moderate strength Pale Ale is made unique by the use of new varietal German Hops like Hallertau Blanc, Ariana and Hull melon. The Chuckanut Rye Lager makes a comeback at the end of the month as an autumn inspired lager with a golden color, spicy rye bitterness and creamy finish. And make sure to get in to try our collaboration with Kevin Davey of Porltand's Wayfinder Beer. Our brewers worked with Kevin to brew the 10 Degree Pils. Read more about it in this newsletter. We're back at it again with former Chuckanut brewer Kevin Davey (now with Wayfinder) from Portland, OR. He and the our brewers collaborated to come up with 10 Degree Pils. 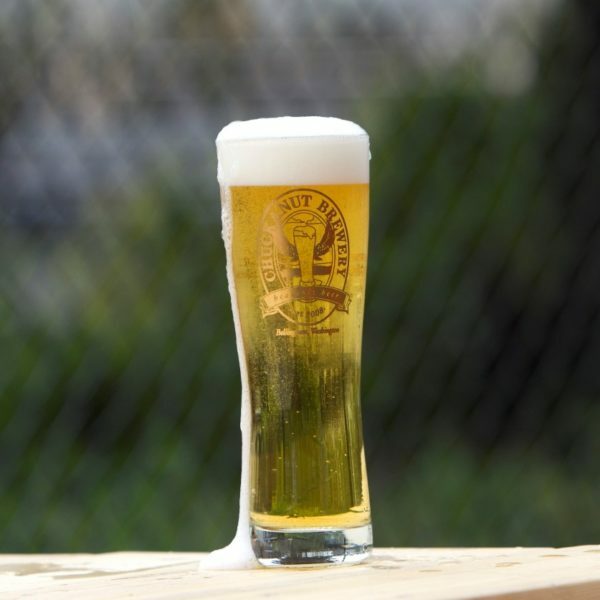 Our collaboration Czech style pilsner is a refreshing light bodied lager. 10 Degree refers to the original gravity of this low alcohol beer (4% ABV). Burnished gold and sparkling straight through the glass, this Pils goes through cold fermentation leaving the refreshing and bright after its long aging process. Chuckanut Brewery's genuine Czech style 10 degree Pils uses floor malted Czech malts and traditional Czech hops! Oct 21 Chuckanut is part of the Tap to Trails Relay and served at finish party! Oct 31 Celebrate Halloween, come in costume North or South and get $4 pint! It's chili weather and Chuckanut will add our Veggie Chili to the regular menu in the Kitchen. Filled with lots of local veggies from our friends at Terra Verde Farm this chili is guaranteed to warm you up. And look for our seafood specials as we move into October. as you won't want to miss any of them! Of course we'll have a new Brulee for you later this month so make sure to finish your meal with a light crunchy special brulee! Despite the dark and heavy moisture of fall we are still celebrating beer at various festivals around the area. This is our first time to join the Brew at the Zoo Fest at the Seattle Zoo October 4 from 5-9 pm. Then we are back at Bier on the Pier in Anacortes 12-6 pm. This is a super fun fest with lots of Oktoberfest celebrating! But if you can't make it to Anacortes our beer will also be at the Bellingham Oktoberfest the same day from 6-10 pm at Bellingham Technical College. On October 13 Chuckanut will be served at the Shoot the Trails celebration photo exhibit at BTC . Enjoy looking at the mountain biking photos while you drink great beer. Brew on the Slough returns on October 20 in La Conner and a new relay happens in Bellingham on October 21 called Taps to Trails. Get a team together and join the relay as you run from one Bellingham brewery to another all ending in a big party! Slowly but surely we will be changing up the logos on our various schwag. We've already got new T-shirts with our update and we are adding black zip hoodies as we speak. Look for lots of other refreshed schwag as we move into the fall so check back often. We have plans to have lots of new items in preparation for holiday gift giving this year. We're pretty excited about the new clean look of the refreshed logo!